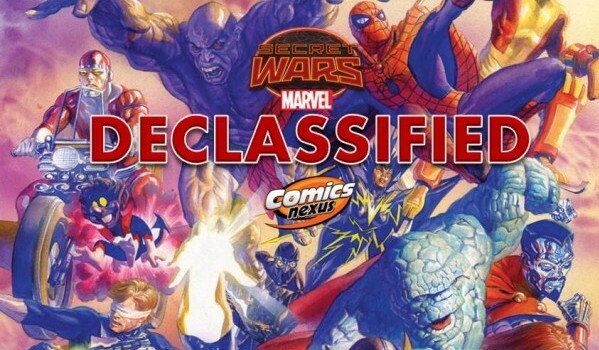 Secret Wars Declassified Week 27: The Laughing Stock of the Year!! One is the loneliest number!! Humour is the order du jour. No better way to critique one’s work that to directly poke fun at it from within. This is the only entry for this week as this event is approaching its finality. 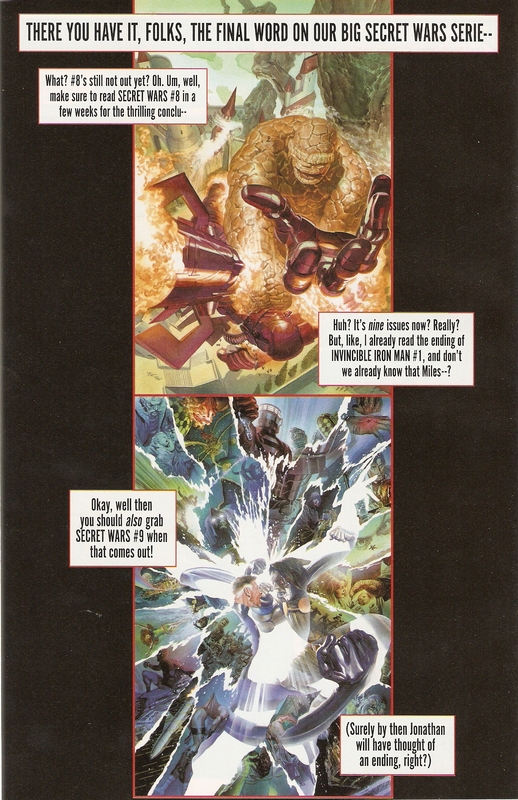 At the yearly Marvel creative summit, Jonathan Hickman pitches his idea for SECRET WARS. It doesn’t matter if his co-workers, colleagues, and chums are opposed to this. The mandate comes directly from editorial!! Plot twist: Hickman has major writer’s block when it comes to a satisfying conclusion! Who better to inspire him and guide him than almighty Doom?? After a walkabout, Hickman comes clean with his superiors Axel Alonso and Tom Brevoort. Win or lose, they are the ones who come out on top. 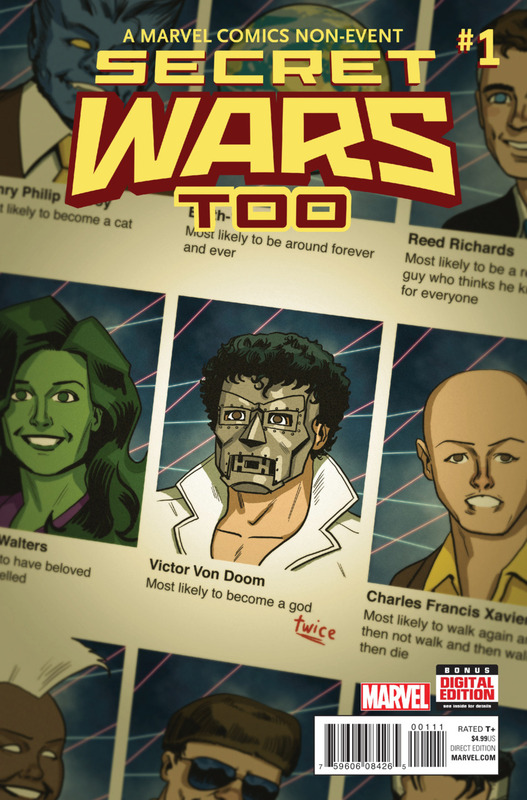 This is definitely Mr. Hickman’s final Marvel work for the foreseeable future. The editor’s note made a point of declaring that. The parallel lives of Peter Parker. 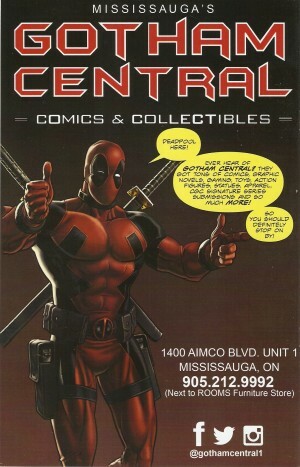 The multiverse has a field day with the Spidey of the 616 experiencing major comic book culture shock. His beloved Uncle Ben and Aunt May as well as his alter ego encounter several other versions of themselves. The exercise in silliness augments when six individuals whose names rhyme with ‘Spider-Man’ appear. Ten takes in total. UGH!! Guard duty along The Shield is a real drag. The best way to break the monotony is star-jumping across dimensions to find the tastiest slice of the American favourite. Kate Bishop convinces her pal America Chavez to join her in this quest. They hop through a few domains. The end result is finding Pizza Dog!! Kate has glimpses of remembrance past when she spots the adorable pooch. Dennis Dunphy. Gone and certainly forgotten. Until recently. Due to an erroneous incantation resurrecting the loathsome loser. Time to re-start his career. He makes short work of the Serpent Society. He gets a major confidence boost from Jarvis. He and Rage become the tag team supreme of the UCWF. Mr. Dee gets to have the most perfect day in the life. The Incursion arrives. He stands up God Emperor Doom for some pies. When you’re this hungry, they call you Mister!! The giant purple-panted G-man is cursed with satisfying his insatiable appetite. His heralds are the NY’s finest urban heroes: Daredevil, Jessica Jones, and Spider-Man! They are unwilling pawns in his quest to supercede the Watcher’s followers. One dimension in particular has the Ultimate Wi-Fier. Spidey decides to break the chains by rigging the device. Galactus and the Big Bald-Headed Guy exchange info. This leaves the other deeply disturbed. Galactus decides to relinquish him domain over Hell’s Kitchen. The heroes for hire are free. One snag: DD is welded to a chair. Cyclops versus Wolverine for the eternal love of Jean Grey quickly goes southpaw [natch!] when Beardevil cuts slashes in!! He manages to kill Logan and toss his head aside. He assures the multiple Scotts that he is a fuzzy wuzzy bear. Foggy Nelson arrives and takes him down in true Elmer Fudd/Punisher style. The scene is re-played when Foggy Bearson shoots his human counterpart. Jean materializes and scolds the three Cykes for lateness. She soon forgets all that and becomes smitten with the alluring ursine. Some bears have all the luck. The creator of The GOON takes on another four-lettered individual. The Latverian libertine is now a reality TV star. He already had an ego the size of Earth. For him to preen in front of the small screen becomes him! 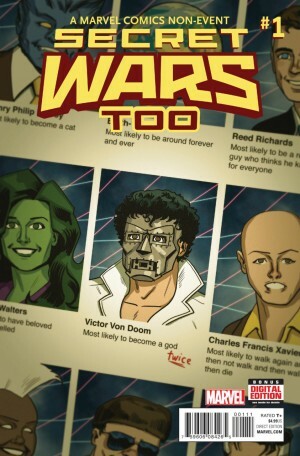 The heroes cannot take him seriously especially not ‘dumb’ Hulk who believes Paste Pot Pete is a classic villain in the truest sense. OUCH!! Not to knock the enormous talent that went into this one-shot but the intended effect was off-putting. I will not conceal my contempt at the lateness as the end of the year approaches. I’m glad that Marvel gets the last word(s) about the remaining dual issues for Mr. Hickman’s opus. When exactly will #9 launch?? Much appreciation to my local comic shop.